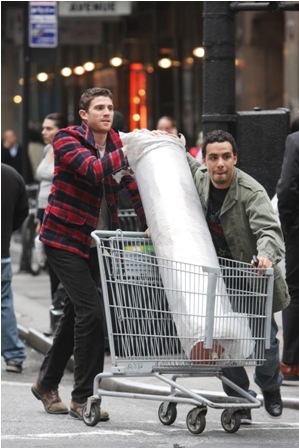 CHICAGO – Ben (Bryan Greenberg) and Cam (Victor Rasuk) could accurately be compared to Vinny and Eric five or six years before they made it big in the first season of “Entourage”. With a similar style and from much of the same production crew (including Mark Wahlberg), “How to Make It in America” pales in comparison to its inspiration. Ben and Cam are a couple of friends at that quarter-life crisis point when people often put their dreams on a shelf forever or take one last stab at them. Both are connected enough to go to clubs surrounded by people beautiful enough for HBO and sleep with gorgeous women but they can’t pay the rent. As is sometimes the case, it’s almost unsettling to watch Hollywood’s idea of being poor in NYC. This is not true “economic crisis” poverty. It’s the beautiful version of it. Floating around Ben and Cam like Drama, Turtle, and Ari are Ben’s ex-girlfriend Rachel (Lake Bell), a former classmate turned Wall Street rich guy (Eddie Kaye Thomas), and Cam’s gangster cousin (Luis Guzman). Of course, the show also allows for the occasional cameo, this time from fashion icons like John Varvatos. Rapper Kid Cudi steals a few scenes in a small ensemble role. The first arc of the show focuses on Ben and Cam trying to start their own denim line called “Crisp,” an ironic choice of label considering it’s a word that never applies to the show. Greenberg is a pleasant enough lead and Guzman is always welcome, but the show has no identity after its first four episodes. It’s impossible to tell what is intended to draw audience interest: Is this a show about good guys climbing the ladder to success? Ben getting back with his girl? Just a slice of life in NYC? It doesn’t work as any of the above coming across as unfocused as that friend who will go on and on about his career plans after a few beers but do nothing about them when he sobers up. As Hollywood plays a major role in “Entourage,” New York City must play one in “How to Make It in America” but even that’s missing from the final show. Sure, Ben and Cam hop around town and allow for a lot of exterior shots of the city that never sleeps but the writing never feels like it knows this town in a way that it could become a character itself in the arc of the show. Making it in New York is different than making it in Hollywood or anywhere else for that matter and the show never gets that gritty street sensibility that it needed to approach realism. And that’s the biggest problem with “How to Make It in America”: it never feels genuine, just generic. It’s so blatantly cut from the same pattern as “Entourage,” merely made with inferior fabric. ‘How to Make It in America,’ which airs on HBO, stars Bryan Greenberg, Victor Rasuk, Mark Wahlberg, Eddie Kaye Thomas, Lake Bell, and Luis Guzman. The show premieres on February 14th, 2010 at 9pm CST. Submitted by Anonymous (not verified) on March 2, 2010 - 8:00pm. I think before you review something, learn and understand the culture on which it’s based. Your review is written as if you have any idea what living in New York is like/about.